Does your little alien have a party coming up and has given you the task of planning an awesome Ben 10 party? Well, no need to panic because you have come to the right spot! With a great selection of ben 10 activities, games and party printables all you will have to do is supply the location. We have used a variety of aliens from the different phases of the show so that you can pick and choose according to your little one’s preference. So put on your Omnitrix and transform into the alien party planner that’s hiding deep inside because your Ben 10 bash is just a click away!! This is an activity for the guests to get in touch with their creative sides. You will need to get an array of different craft materials for this activity. Items like pompoms, craft sticks, pipe cleaners, googly eyes, beads, buttons, empty toilet paper rolls or anything you can think of that would help to create an awesome alien. Have the supplies spread out on a table and have the children gather around. Allow the children ample time to get their aliens put together. You could even have an episode of ben 10 playing while they build. Once they are done they can take turns naming their aliens and telling each other about the powers they have. The intergalactic bounty hunter Khyber is back and ready to catch some of bens aliens. Have the guests pick an alien name and assign one person to be Khyber. Put a blindfold on Khyber and have him stand in the middle of the room. Have all of the aliens spread out around the room. They must stay in the same spot while being hunted. When the game begins the bounty hunter will call out an alien name and the person who chose that alien has to make a noise to hint at their location. Khyber must try to locate them without running into another alien. If they run into the wrong alien, the bounty hunter has to call out a different alien name. This continues until he captures an alien he has called out. When he does, you will switch the alien with the hunter and begin again. You will need index cards, scrap paper and pens for this game. Write down the names of several aliens, one on each index card, and a short description of their powers or physical appearance. When you are ready to play the game you will give each child a blank piece of scrap paper and a pen. One by one you will read the description of the alien on the index card but do not name the alien. The children must guess which alien they believe you are describing. After you have read them all you will give the answers and see who had the most correct guesses. The winners get a small prize. Here is an example list of aliens with descriptions. Heatblast- this alien is a pyronite and is made of magma and covered with a reddish brown charcoal crust. He can use fire at will. Wildmutt- This alien is from garbage planet Vulpin, looks a bit like a dog but has no eyes or tail. This is an activity and a game all in one. For this you will need to purchase some slime, you can use green pudding, pair of tweezers, a marble, a 9x13 pan and gummy body parts from oriental trading. To begin you will put the slime in the pan, you want it to be filled enough to cover the marble so it’s harder to find. Pour all of the parts in with the marble and spread them out on the bottom of the pan. Again make sure they are not visible. When the guests arrive and are ready to play you will have them line up and give the first child the tweezers. They will have 30-45 secs. To do the autopsy and pull as many body parts out as possible. If they find the marble and successfully extract it with the tweezers they get a special prize at the end. The one with the most parts pulled in the shortest time wins the game. All you will need for this game will a small sandwich size plastic bag for each child, tape and printed pictures of the many different aliens from ben 10. Print out pictures, each one about the size of a half dollar, and set aside. You are going to put the Aliens all over the party area both high, using the tape, and low. The guests will gather around and each will receive a plastic bag. The object of the game is to collect as many aliens in your bag as you can. When five minutes is up, the children will count all of their aliens out and the one with the most wins the game. This game can be played indoors but would work best if played outdoors. All you need is a Frisbee, a hula hoop and some string. Hang the hula hoop up about four feet from the ground where you can see through the center of the hula hoop when facing it. The Frisbee can be decorated like a spaceship if you like or you can just inform the guests that it is the space ship. Have the children line up and give the first one the spaceship. The object of the game is to get the ship back home to its own galaxy by sending it through the hole in space, the time warp. The children will get three tries each to get the ship back home. The ones who get the ship in will continue competing until there is one left and they are the winner of the game. When you send out your invitations invite your guests to create their own costume of their favorite ben 10 character. After everyone has arrived have the children line up. Have each one step out of line and explain their costumes and what they used. After everyone is done, have the children vote on who has the best costume. The winner takes home a prize. This game will get the kids working and get those creative little minds going. You will need to gather some regular household items for the children to use as props. Things like spatulas, a plastic bat, oven mitts, empty paper towel rolls, pillows, a remote and anything they can use to create a good scene. Separate the children into groups of 2-3, or sized according to your guest amount. Give the groups five minutes each to come up with a ben 10 episode of their own. They must get in front of the other groups and act them out. But before they go on, give them four to five random props and tell them they have to use them during the scene. Everyone will gather around and get a good giggle out of the teams acting and thinking on their toes. This printable party supplies kit is so easy to use. Everything comes in ready-to-print PDf files. All you do is print and cut! 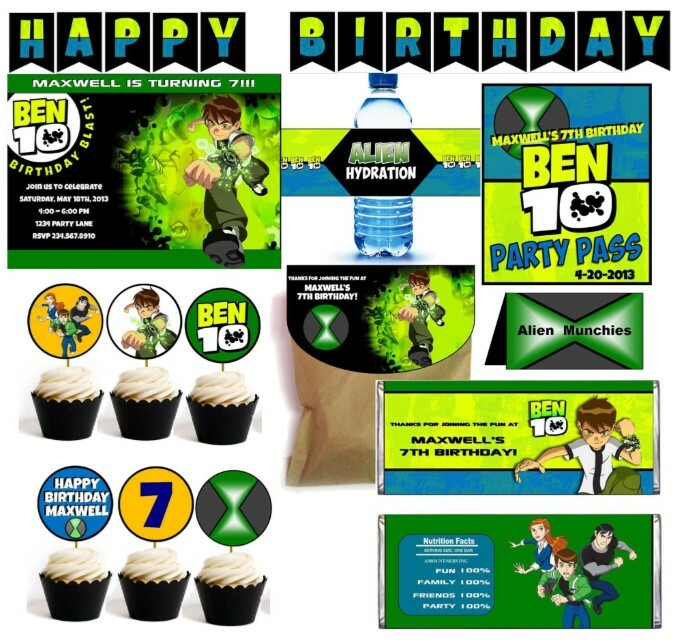 This Printable Party Supplies Kit comes with everything you need to get your Ben 10 Birthday started! 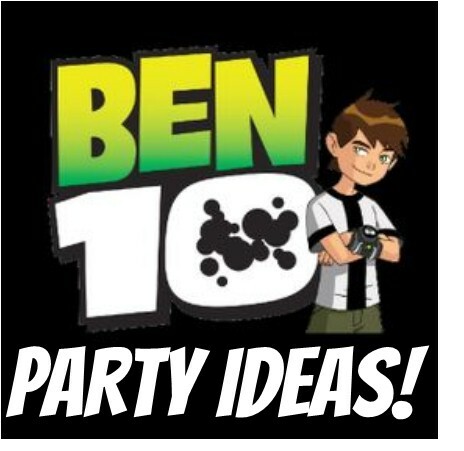 See Full Details on these Ben 10 Party Supplies!